Here's the dilemma: You want to listen to music while you ride your bike but you don't want to block out vital traffic sounds, such as sirens and horns. A portable speaker that attaches to the handlebars can make a safe compromise. One such model, the NYNE NB-200, provides an extra bonus. In addition to delivering streaming music, the Bluetooth speaker also can handle incoming phone calls. 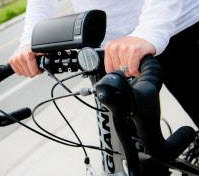 Equipped with handlebar clips, the speaker can easily be attached — and unattached — to your bike's handle bars. Or if you prefer, you can attach it to a stroller or exercise bike. While riding or strolling, you can listen to music streaming from a connected Bluetooth device stashed inside your pocket or backpack. Don't like the song? Press the speaker's forward button to skip to the next song. You also can adjust the volume up or down. If your connected Bluetooth device happens to be a smartphone, you can answer calls through the speaker's microphone. When a call comes in, press the answer button on the speaker and start talking. With the help of noise-canceling technology, the sound quality is good enough for long conversations, even when riding at a fast clip. You also can use the speaker's controls to call back the last incoming number. Priced at $130, the speaker includes a mini-USB charging cable, a 3.5 mm audio cable and a carrying bag. You can create energy while you pedal with Ecoxpower, a pedal-powered headlight and smartphone charger for your bike. The package includes a water-resistant case for a smartphone or GPS device, an LED front headlight, a red rear tail light, a universal mount and a USB adapter. As the front wheel on your bike turns, the device's clutch engages between the tire's spokes. This action fuels a generator that powers the lighting system and the rechargeable battery that keeps your phone charged. The charging system from Ecoxgear costs about $100. The Toddy Wedge, a fabric-based phone holder, provides two-sided cleaning: A plush microfiber material on its bottom section can clean your phone's frame while a lighter silk microfiber can gently polish its screen. In between cleanings, the Wedge keeps your phone or other mobile gadget propped up for easy viewing. Available in a variety of colors and patterns, the Toddy Wedge from Toddy Gear costs about $15. If you need to stretch out the connection between your iPhone and your charger, StarTech's Long Dock Connector USB Cable for the iPhone, iPad and iPod can help. Measuring 10-feet long, the wire includes a tapered connector that makes it easier to plug in a device without removing its protective gear. It costs about $30.